We have stayed at Planet Baobab just once (July 2015) and thought it was great . The staff are very friendly, warm and helpful (some of the best service I have seen in Botswana). I would have no problem in going back there. Planet Baobab is located just off the main road between Maun and Nata, a few kilometers east of the turn-off to Gweta. 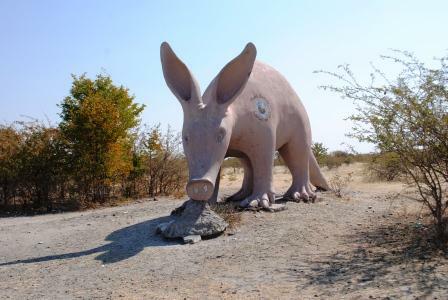 The entrance can clearly been seen as there is a huge aardvark statue on the road – see top picture. There is a main block that has a very nice bar with an interesting shaped bar counter. There is also a very nice dining area and lounge. There is a swimming pool that has an uncover section as well. Cute loungers are available at the pool. 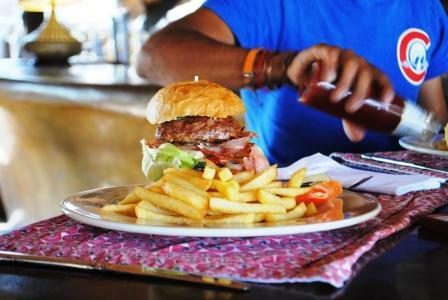 We didn’t eat there, but from the look of the burger a client was served at the bar – it looks good. The chalets are traditional Motswana huts that are very attractive and nicely designed and finished inside. They are also very clean. The campsites are very spacious and have a thatch shade area, braai stand, with grid, a fire pit and there is electricity. The ablutions are good and also kept well clean. Planet Baobab does offer tours in the area, an option we did not take-up. It is a good base to visit the Makgadikgadi Salt Pans, Nxai Pan and Makgadikgadi National Park. Adored the aardvark statue 🙂 Wowzer on all the beautiful Baobab pics. Chalets look really nice and lots of smiles there. Was the cost reasonable? We are planning a similar trip in Aug – did you pay for Nxai day trip at the gate? Loved reading your blog – made our trip seem more exciting! Yes you need to pay park fees to go on a day trip to Nxai Pan.